The week in June in which developers from all over the globe descend on San Francisco for Apple’s WWDC can only be described as digital armageddon in respect to Cupertino’s servers. Developers eagerly boot up spare MacBooks and test devices to download the first developer previews of whatever has been announced, and this year proved to be no different with the introduction of Xcode 7, watchOS 2, iOS 9 and OS X El Capitan. 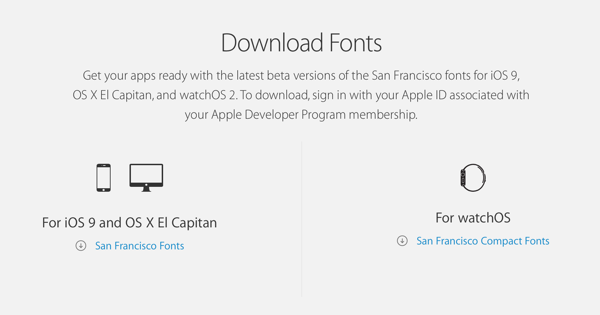 To compliment those available downloads, Apple has also made its ‘San Francisco’ system font available through its Developer Program for all platforms and registered developers. The San Francisco typeface isn’t a stranger to developers, or the public. The font made its initial debut as the type of choice when the Apple Watch was first shown off, and has ultimately made the cut by being the main system font within watchOS. After playing around with a few different fonts in the last three generations of iOS, it seems that Apple is ready to apply some consistency across all of its three platforms and integrate the San Francisco font as the main system font in iOS 9. The download has been made available for those who are currently looking to design and develop next-generation apps for the future of iOS, OS X and watchOS. In addition to making the individual font available across all platforms, Apple has also provided access to a Pandora’s box of goodies for those developers who are interested in powerful text handling and editing within apps they are building for iOS 9, OS X El Capitan or watchOS 2. Developers now also have access to Apple’s TextKit API, the Apple Font Tool Suite and internal specifications for the TrueType font format. It’s a certifiable playground of excitement for those who are seriously interested in building powerful apps that get the best out of beautiful typography, such as the San Francisco font. 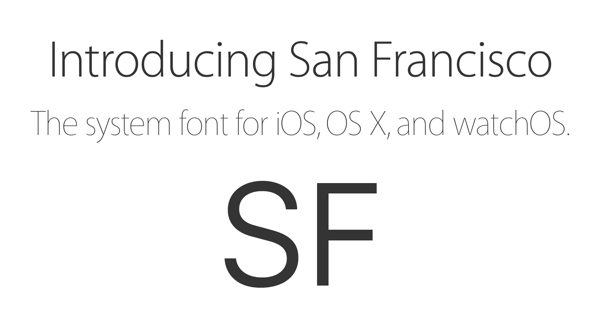 Accessing and interacting with the San Francisco font won’t be entirely new to developers. The initial launch of the Apple Watch had been preceded by the compact watchOS variant of the font being made available through the Apple Developer Program. This latest release sees that availability extended to support the iOS and OS X specific variants of the font. It is meant for developers only until OS X 10.11 is released. So sign up as a developer. Don’t cry sour apples. unlock all AT&T devices and provide the best service to all our customer. most of the 3rd party unlocking sites unable to unlock AT&T anymore. for 5 of my phones after the database shut down.